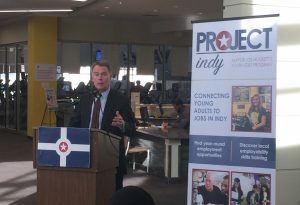 INDIANAPOLIS – For the third year, Mayor Joe Hogsett is working with EmployIndy, the Greater Indianapolis Progress Committee, and the Marion County Coalition on Youth to connect thousands of young adults to job opportunities in 2018. At a press event held at the Avondale Meadows YMCA, Mayor Hogsett and the Indy Chamber encouraged employers to engage with the program and announced a new employability skills system designed to get 16-24 year-olds job ready. Project Indy is a smart way to give thousands of local young people job experience, useful skills, and safe and productive alternative to crime and gangs. Mayor Hogsett’s summer jobs program comes at no additional cost to taxpayers, funded through federal grants, corporate donations, and community organizations. To ensure that young adults are ready for job opportunities, EmployIndy and the Indy Chamber have partnered to create the Job Ready Indy program. Beginning in March, local youth can enroll in Job Ready Indy workshops with various partner organizations around the city and earn up to six badges, each focused on various skill sets that will set them up for success in a job and appear on their Project Indy profiles. While Project Indy works to connect high school youth with summer job opportunities, the program also encourages mentorship and career training opportunities as well as jobs for participants out of school seeking the first step in their career path. With the added skills and training now available through Job Ready Indy, Project Indy will enable local young people to build the foundation for a successful career in the Indianapolis workforce. Project Indy is uniquely positioned to connect the supply of jobs with local young talent as employers are thinking about their needs for this summer and beyond. Local youth can be a solution for many of these employers seeking talent, and with the added employability skills offered through the Job Ready Indy courses, workers accessible through Project Indy will be better prepared to take on jobs that require a variety of responsibilities. Employers who participate in Project Indy also have the exclusive opportunity to kick start career paths and develop our city’s future workforce to fit their industry’s needs. Each Sunday in February, Mayor Hogsett will be engaging local churches and faith-based organizations to encourage young people and employers to take advantage of all that Project Indy has to offer. Attendees of Congressman André Carson’s Your Opportunities Job Fair in March can stop by the Project Indy booth to learn more about the program. Young job-seekers and employers can learn more and sign up at projectindy.net. INDIANAPOLIS, IN – January 24, 2018 – Since 2011, EmployIndy has been demonstrating a commitment to community workforce development by distributing over $3 million on behalf of the City of Indianapolis’ Department of Metropolitan Development to local community-based organizations through CDBG. This funding has resulted in neighborhood-level employment services for over 6,000 residents. Recently, EmployIndy awarded an additional $500,000 to five local, community-focused organizations: Mary Rigg Neighborhood Center; RecycleForce; Fathers and Families; Second Helpings; and Indianapolis Urban League. EmployIndy is committed to partnering with organizations who are engaged in barrier-busting, workforce development activities, and working to support, improve, and coordinate effective neighborhood-level employment and training programs. The Community Development Block Grant is competitively awarded to an organization because of their active demonstration to connect underrepresented residents to jobs and career pathways leading to self-sufficiency and family sustaining wages, thus improving the area in which they reside. Because of their focus on local community growth, Mary Rigg received grant funding to further neighborhood-based services to specifically target individuals who are underemployed; unemployed; do not have an HSE degree; ex-offenders; and/or single parents. “The goal of EmployIndy is to enhance and strengthen, rather than replace, the services offered within neighborhoods,” says EmployIndy’s Senior Director of Development, Chelsea Meldrum. In order to alleviate major employment barriers, such as criminal backgrounds, transportation, and low education, EmployIndy works closely with community- and neighborhood-based organizations who are uniquely positioned to offer a variety of services that bring workers into the mainstream economy. The funds distributed to RecycleForce will focus on creating successful transitional employment for re-entry citizens through increasing availability of educational services, job skills training, career exploration, and supportive services. Another focus of CDBG is career navigation services. These services use the ABC model (Any job, Better job, Career) to help those who are either unemployed or underemployed to find their next step – whether that is forwarding their career, changing their field, or furthering their education. Second Helpings and Fathers and Families Center are using their grant money to further training programs and arm graduates with success through obtaining credentials and preparing for job readiness. EmployIndy places a high significance on the quality and impact of services to the participants being reached. The CDBG funding EmployIndy has distributed over the past seven years has led to occupational skills training and credentials that directly result in residents finding employment. The award given to Indianapolis Urban League will help grow that number through serving low-income and returning citizens by granting them with career training and services to become self-sufficient. By seeking to help individuals who are experiencing significant barriers to employment, EmployIndy is working with those in the community to ensure residents have access to a variety of services to obtain the skills needed to enter into jobs and, ultimately, careers. INDIANAPOLIS, IN – January 18, 2017 – Amid the final round of worker dislocations at Carrier, EmployIndy and United Steelworkers Local 1999 are encouraging displaced workers to enroll in Trade Adjustment Act (TAA) benefits with local WorkOne staff. When large layoffs occur, efforts are made to provide support to affected workers to immediately impact their next steps. EmployIndy has coordinated job fairs and staffed WorkOne case managers inside facilities to be available to help workers. WorkOne staff have been providing career coaching, connecting individuals to training, and identifying how their existing skills can be best utilized for a career shift. WorkOne staff also registers displaced workers for funding such as Mayor Hogsett’s $1000 Carrier Worker Grant, which offers assistance to reimburse costs incurred while looking for new employment. This includes expenses such as transportation, childcare, utilities, and rent/mortgage payments. EmployIndy representatives register workers to receive TAA benefits for training and help local employers navigate the hiring incentives offered via Next Level Jobs and other City of Indianapolis funds. EmployIndy is eager to guide these workers – and all Marion County residents – toward career success in an evolving local economy. The organization’s leadership refers to the strategy as “building a workforce ecosystem” in which numerous community organizations, supportive service providers, employers, and educators are aligned in workforce development efforts. “We strive to connect people to opportunities to gain the skills needed for modern jobs, and then also work to connect employers to the people who obtain those skills,” says Marie Mackintosh, Chief Operations Officer of EmployIndy. Resources are available for all Indy residents who have been laid off, are underemployed, or are in need of job skills – but for those who are eligible for TAA benefits, such as displaced Carrier and Rexnord workers, there are deadlines for certain funding based on the date their dislocation occurred. Dislocated workers can attend a special enrollment session for TAA benefits taking place at WorkOne Indy West, at 3400 Lafayette Road, this coming Saturday January 20th, from 10:00am until 1:00pm. They can also access services during normal WorkOne business hours.